It's time to help everyone get on the same page so we have better info when going into the backcountry and maybe Bob and Cody can give us a start. Below is a link to a photo of the Nambe Chutes. If you know the name of a specific chute email it to me at john@imafirst.com. Also let me know if you have skied the chute. I will collect the names and put them to the chutes. Reference the "N" number so I know which one you are talking about. I'm sure there are numberous names out there for the same chutes but this will help us identify them. This will also help us all with our snow reports and backcountry beta. I have skied N+6, N+4, N+3, N+1, N, N-1, and N-2. Most of those multiple times. I have no name for any chute, face, or billy goat line in Nambe. I have previously used Upper, Middle, and Lower for general reference to the Nambe chutes in snow and ski discussions. I personally do not like formally naming any line unless I know/believe that I am part of the first group to ski it. 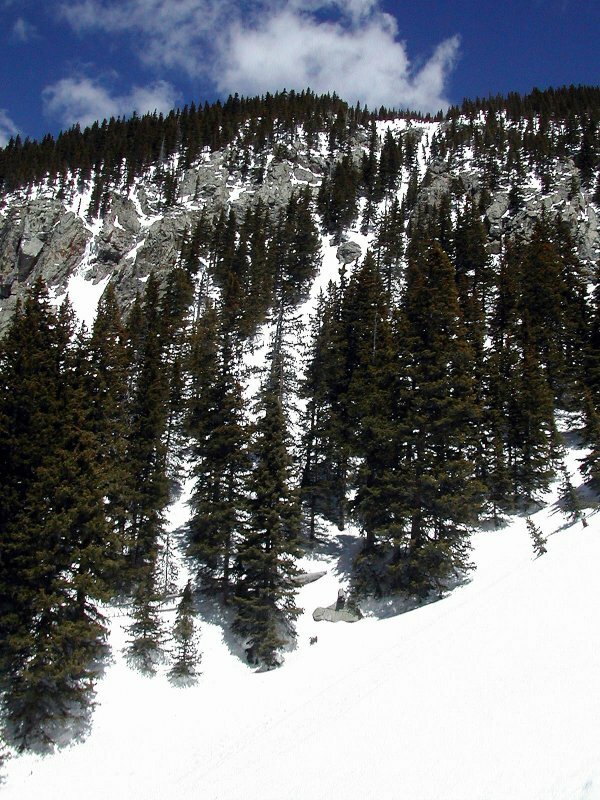 The only line I/we have ever applied a name to is Mary's Chute near Gold Peak here in NM, as we beleive that we were the first to ski that particular line in a rather remote basin. I also do not believe that the Nambe chutes are worthy of individual naming. 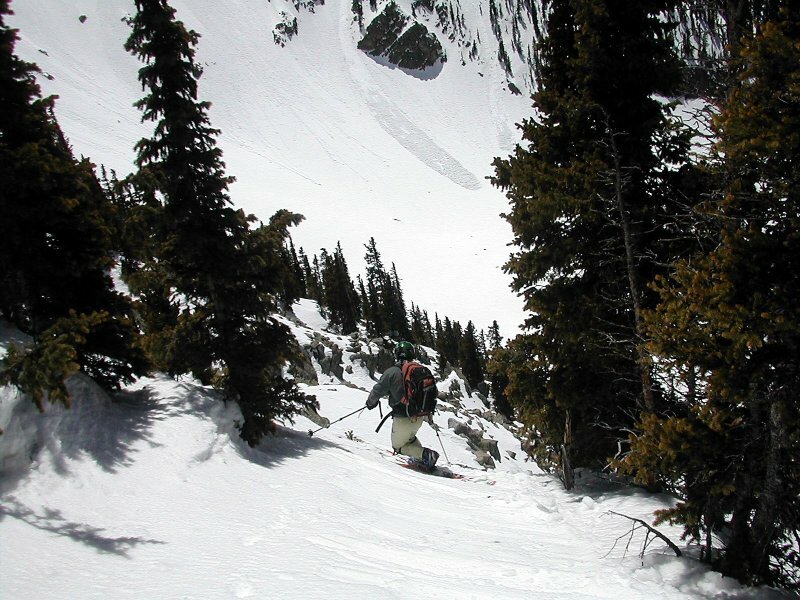 Naming of ski routes should be limited to faces and major chutes, and not every square inch of a bowl. This, however, is my opinion and thoughts on the subject, and I'm sure others think differently. On a side, I know Cody feels that Nambe is an "extension" of his terrain, but I really hate his names. This is kind of interesting to me. I've thought about the names for the chutes that I've heard from others and I've kind of marveled at the inconsistency. There is one exception - the N-1 chute on John's picture has been pretty universally called the Boot Out chute. I don't remember hearing the names Rubicon or Styx before now, but I seem to forget lots of things. I've heard names given to the N-4 and N-5 chutes off of east Raven's into the Nambé, but I forgot those too. I've skied pretty much all of the shots between N+4 and N-5 and then some, except for maybe N+2. I know Cody has names for a lot of the features around there, but they tend to be a little idiosyncratic, reflecting his experiences there. But I'll ask him about them. While I kind of agree with Matt that the honor for the official naming of runs should probably go to the first party that skis them, it would probably be near impossible to find those for the Nambé. But I'd like to hear what other people call the shots. Still, I think the 'official' name for the pretty chute that goes from the south end of Deception into the 'shed should be "Illegal Chute" because it fits so well. Being a rock climber for many years I do firmly agree that the first person doing a route names it. And, like Matt mentioned we will probably never know who the first's where in the Nambe. I'm sure there were some great hard men of the early days that dropped into these chutes many years ago and didn't care about the name and just enjoyed the day. Like Bob I've heard all kinds of crazy names out there and still not really sure what exact chute they are refering too. The goal of this photo is to just see what names are out there and see if there is a consitance to any of them. More than likely there are probably only a handful. I do know that I would like to know that a particular snow report I read in the morning is refering to the same chute I'm about to drop in to. Also, in the case of an emergency it woud be great to say the injured person is at "Such and Such chute in the Nambe" vs "the Nambe". I'm interested to see if any name come in or is this it. I'm apparently in the minority. I just don't think alot of Nambe is name worthy. John- your point about rescue is interesting, but Nambe isn't really that big. 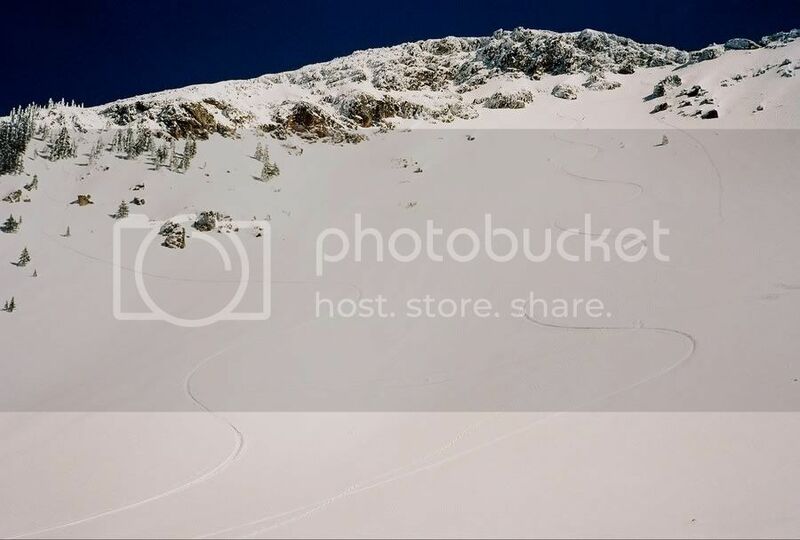 I think for the education of any backcountry skier that labeled photo with generic names will help crossreference patterns and experiences people have had in the Chutes. Thank you for a great contribution.